^ Eberhard Breitmaier (2006). 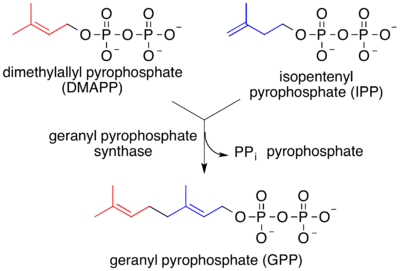 “Hemi‐ and Monoterpenes”. Terpenes: Flavors, Fragrances, Pharmaca, Pheromones. doi:10.1002/9783527609949.ch2. ^ Kumari, I.; Ahmed, M.; Akhter, Y. (2017). “Evolution of catalytic microenvironment governs substrate and product diversity in trichodiene synthase and other terpene fold enzymes”. Biochimie. 144: 9. doi:10.1016/j.biochi.2017.10.003. PMID 29017925. ^ D. V. Spracklen; B. Bonn; K. S. Carslaw (2008). “Boreal forests, aerosols and the impacts on clouds and climate” (PDF). Philosophical Transactions of the Royal Society A. 366 (1885): 4613–26. Bibcode:2008RSPTA.366.4613S. doi:10.1098/rsta.2008.0201. PMID 18826917.